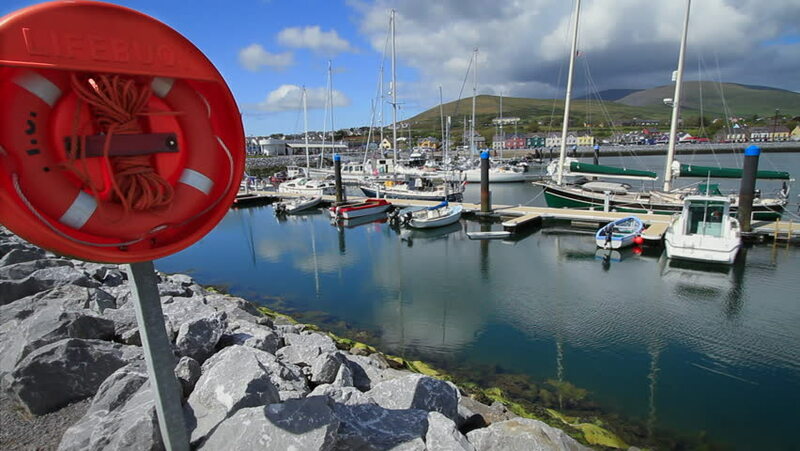 Shot of Dingle Harbor and a Lifebuoy. hd00:10Cascais, Portugal - August 6, 2017: yacht and motor boats at Cascais marina. The Marina is located under the Cascais Cidadela, on the southern tip of Cascais. Summer holidays in a sunny day. 4k00:13VAGAR, THE FAROE ISLANDS -APR 14, 2018: Boats at Midvagur jetty port in morning. Midvagur is a village on the south coast of the Vagar island and the largest town on this Faroese island. 4k00:07SAMUT SONGKHRAM, THAILAND - CIRCA MAY 2017: View to the empty Amphawa Floating Market in Samut Songkhram, Thailand. Amphawa is one of the most famous floating markets in the world.